Working at the Kids and Teens department is always interesting; The editors and the drawers of DonaldDuck get their jokes and inspiration from all sorts of places, even around the office. 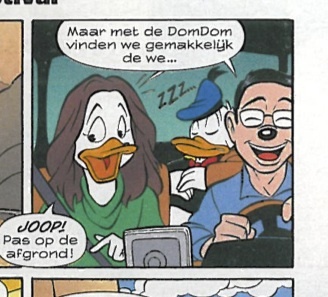 They ‘used’ me to make a character in an actual duck story; I’m a geeky guy who drives around a celebrity – how cool is that! If you want to read it, get a copy of the latest TrosKompas!